Tyrocircle also serves as a diagnostic tool (dashboard) for universities. Tyrocircle will assist universities with their network analytics and improve university efficiency. Here universities will be able to review usage metrics, individual courses and student progress. 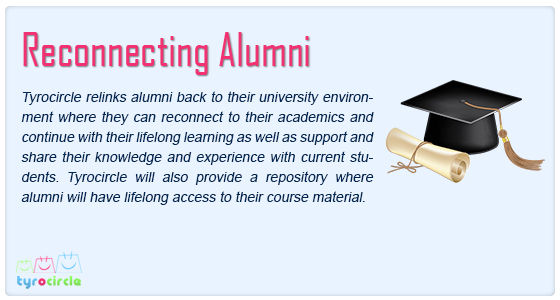 Our pragmatic social platform is designed to facilitate university collaboration and knowledge transfer between students, academics and alumni. 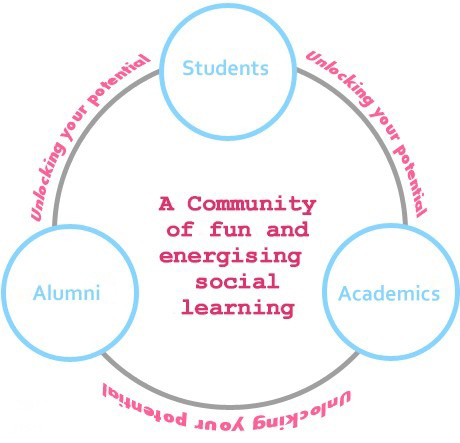 Tyrocircle provides students a secure community of fun and energising social learning. This equips them with the confidence they require to strengthen their student-to-student learning. Here they can request and provide help through the use of built-in flags. Students can join Scholar Rooms, partake in knowledge transfer and university collaboration. Tyrocircle encourages academics to create their own academic profile where they can list and publicise their research interests. They can connect and collaborate with others in the same university or from other universities. Tyrocircle permits academics to freely communicate with their students in a less formal way but at the same time delivering the same message. 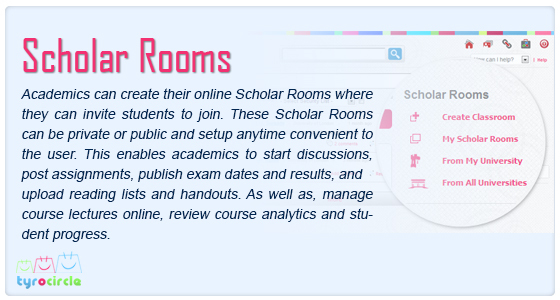 Academics can create their own online Scholar Rooms for their course modules where they can invite students to join. They can also manage their course lecturers and seminars online, review course analytics and student progress. Tyrocircle encourages all users to create their academic profile that will not be withdrawn once they have completed their university course. Here users will be able to add information, as much or as little as they want in regard to their university, study degree and their course modules. All users will be able to follow other Chirpers based on their security preferences. Tyrocircle is designed to engage students, academics and alumni to connect and collaborate with one another. Tyrocircle provides academics with the ability to create their secure online Scholar Room(s) authorising access to users with an authorised code. Here the academics will have two-way communication with their students in a convenient and secure way. Academics can post announcements, start discussions, post assignments, publish exam dates and results and, upload reading lists and handouts. As well as, manage course lecturers and seminars online, review and monitor course analytics and student progress. 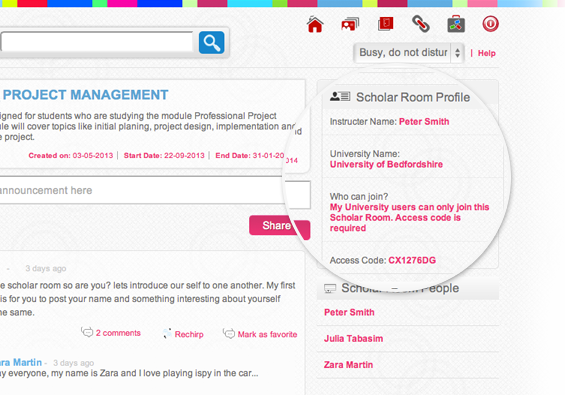 This functionality will enhance social learning; university collaboration and knowledge transfer among one another. Tyrocircle has designed built-in social learning flags acting as a facilitating service empowering students, academics and alumni to collaborate and help one another. This functionality enables the user to search profiles to find suitable Chirpers for peer-to-peer learning, request and offer help as well as act as an indicator for social interaction. Our indicator flags encourage and empower social learning through providing opportunities for collaboration within departments and universities. These flags will help save time, enrich discussions and broaden connections between users. Tyrocircle is accessible anywhere in the world. 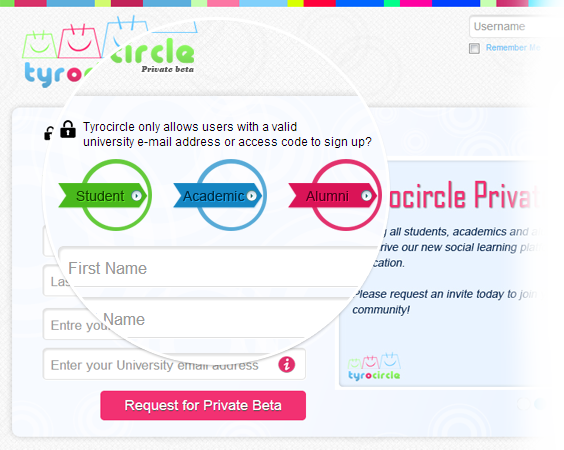 With Tyrocircle you can stay connected with your university, Chirpers and Scholar Rooms from your mobile device. 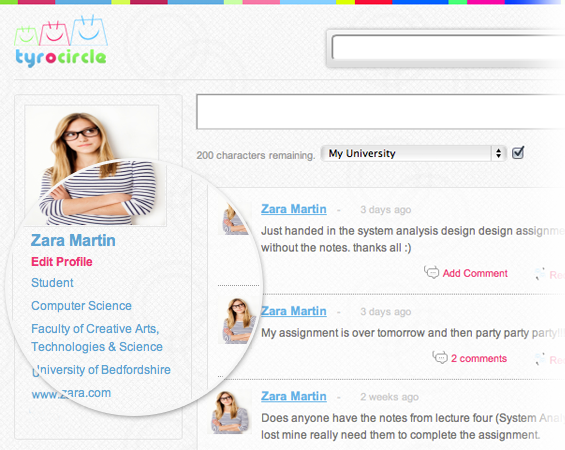 You can easily share Chirps; partake in discussions with your university and between other universities. If you are interested to find out more or if you have any queries or comments about Tyrocircle. You can e-mail us or alternatively you can write to the team.